BBC NEWS | Europe | Who won World War II? The Nazi regime collapsed in May 1945, squeezed ever more tightly between two fronts - the Soviet Union on one side and the Western Allies on the other. But which of these fronts was the most important? Throughout the Cold War, and ever since, each side has tended to see its own contribution as decisive. "In the West, for some time... public opinion has taken the view that the Soviet Union played a secondary role," says the Russian historian Valentin Falin. On the other hand, opinion polls show that two-thirds of Russians think the Soviet Union could have defeated Hitler without the Allies' help, and half think the West underestimates the Soviet contribution. The success of the Western Allies in the struggle for air supremacy. Mr Overy says that for decades Soviet historians underplayed the significance of US and UK lend-lease in the Soviet Union's success, but that Russia has recently shown just appreciation. Mr Falin, however, says Russians never forgot the help they received from their allies. "You ask any Soviet person, whether he remembers what a Dodge or a Willis is!" he says. "The Americans supplied us with 450,000 lorries. Of course, in the final stages of the war this significantly increased our armed forces' mobility, decreased our losses and brought us, perhaps, greater success than if we had not such help." Mr Overy accepts that the Western powers played a smaller role on the battlefield itself than the Soviet forces but says their bombing campaigns made a huge contribution. "Bombing diverted a lot of manpower and military equipment from the front in Russia, while it restricted the expansion of the German war economy," he says. He also agrees that the West still only has a weak understanding of the Soviet Union's role. "Because Britain and the US had to invade Europe by sea [Italy in 1943, and France in 1944] they have more of a sense of 'liberating' a German-conquered Europe," he says. Mr Falin, meanwhile, argues that the war could have been brought to an end more quickly if the second front, in France, had been opened before 1944. "How many millions of people would have remained alive?" he asks. "Many death camps reached full power precisely in the second half of 1943 and in 1944." 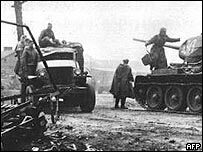 Mr Falin cites figures suggesting that German forces suffered 93% of their casualties on the Soviet front and argues that this shows the Soviet contribution was decisive. But he adds that every single US, UK, Canadian or other Allied soldier who died "made a big, important and necessary contribution to the victory, which was a shared victory". Technically the Red Army defeated Nazi Germany. Eisenhower halted the Western allies and allowed Zhukov and Konev to commit the Coup de Gras by taking Berlin. However, no single nation can claim credit, victory very much belonged to all the Allied forces. We all seem to forget that Soviet Russia was instrumental, together with Nazi Germany, in starting the Second World War, attacking Poland in September 1939. Russian and German forces even held joint victory parades in Polish towns. Russia was allied with Nazi Germany, and Russia only joined the fight again Germany after Germany attacked Russia in 1941. In Russian history, the war only started in 1941. Russian boys won the war! It is considered politically incorrect in Western countries to admit that Russians did anything good. These days they pay tribute to Nazis in Baltic countries, not to those who opposed them. World War 2 belongs to history now. Who won it is not all that important, but how to prevent another one and eradicate Hitler-like leaders from this planet. We won! That's all it matters! The Nazi regime collapsed and we got rid of a terrible monster. We should be celebrating and thanking our veterans for their sacrifice. I thank you! I think the problem is more 'mass culture' issue than history. When you watch a Western movie about WWII you can't say even what side Russians fought on. This is a disgrace. And don't forget USSR also fought Japan twice - in 1938/39 (which nearly destroyed the elite Kwangtung army) and in 1945. I don't think you can be so crass as to try and to claim one victor. Too many lives were lost, on all sides, and too many emotional scars left open for anybody to claim to be an absolute winner. Everybody loses with war, it isn't a particularly nice thing to have to engage in and it certainly can't be trivialised by arguing about who made the biggest contribution. Let's not talk about beating Germany, because so many had to sacrifice their lives who should never have had to, and the same on the Allied side. I'm really not sure what all the fuss is about. You can argue either side until you're blue in the face and you'll never change the other side's mind. If the US had never entered the war would the Soviets have been defeated? There's a good chance that the government would have fallen, but there would probably always be successful insurgent groups. If the Germans hadn't invaded the Soviets would they have been able to defeat Britain? Again, quite probably. But if we're asking if questions. How would the world be if the powers that were would have used a little logic and stopped Hitler before he could trump all of Europe? The political climate in the US during the post-war period was such that it was very difficult to admit that the USSR had done anything right since its inception. In the past couple of decades, we've begun to have an appreciation for what they (the Russians) went through. I don't think this was intentional on anyone's part. It's obviously easier, if you're writing a history, to go to source material in your own language and in your own country. It's time to recognise that all the Allies made significant contributions. No one of us could have won WWII by ourselves. The outcome of WWII is what it is. Trying to determine whose contribution was greater is nonsense. If and buts cannot replace the facts that it was an Allied effort that lead to the downfall of the Nazis period. If the Germans had won the Battle of Britain it would have been all over. If it wasn't for us standing alone while our Allies declared neutrality we wouldn't be having this argument. We worked as a team to get the job done and in the end that is all that matters. But could you imagine the 18-32yr olds of today willingly getting on a boat and being told we are entering German occupied France and your job is to storm the machine gun firing German troops from the beaches and accepting it as the right thing to do? Come on - we're the generation that thinks it's too much trouble to vote! The Germans assumed Russia would fall instantly. They underestimated the power of the Russians' patriotism and their genuine desire to do everything possible to stop Germany. Even with Allied assistance, many Russians were fighting with minimal equipment and often little food. That they still refused to back down and continued to fight with all they had until the end makes all the Russian soldiers heroes. Without a doubt, the Soviet Union bore the brunt of World War II, wearing down Germany's war machine in a savage war of attrition. There can, however, be no talk of a "decisive" contribution. Why argue whether D-Day was more important than Stalingrad? Every nation, every man and every woman played their part, and great events were often decided by the heroism and sacrifice just a few men. I wish to commend the British spirit for holding off Germany in the Battle of Britain. Had they fallen, there was no way the US could have crossed the Atlantic to help fight the Germans in Europe. The US contribution ought not to be diminished either by many Brits. The US fought a two-front war on opposite ends of the earth and had to cross the two biggest oceans in order to achieve this goal. Lastly, I wish to commend all the countries who contributed towards the defeat of Nazi Germany and Japan in the Pacific (the forgotten war by Europeans). 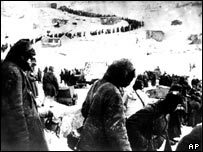 Stalingrad, not Normandy, was the decisive battle of WWII, and the turning point when the German army was forced to retreat. The West, foreseeing the Cold War, was more then happy to see the Russians fight it out with the Germans from a safe distance. The only reason why D-Day happened when it did is because they realized that the whole European continent would be liberated by the Soviets rendering their role irrelevant. Without the Russian Front, Germany would have turned the beaches of Europe into an impenetrable fortress. But without the Allies in his back, Hitler would have sent all his forces to the East and the Russians would have had a hard time stopping him. The truth is that the invasion took place when it was already clear that Germany was collapsing on the Eastern Front. But it is also true that without all the war materials pouring from USA and Britain the Red Army would have suffered a whole lot more casualties, and many a battle would have been lost. The USSR should receive more credit from the Allies than it used to. But it is time that all the nations understood that alone they couldn't have stopped Hitler. It is their union that defeated the Nazis, a victory over the enemy of mankind. All of my grandparents who were still alive in June 1941 fought the Germans. There are places in Russia that lost most of their population during the war. While the value of human life is lower, and readiness for a sacrifice, involuntary and voluntary, more pronounced in Russia, it does not diminish the fact that Eastern Front was a decisive battle. German officers, who were disciplined, were sent to the Eastern Front, since over there the rules were particularly brutal. I always admired British for taking a stand against the Nazis early on. Their bravery inspired others. As one who served in the conflict in Europe, all who joined forces to stem the tide of the horrid Nazi regime played their part in its defeat. Obviously the credit for destroying the Nazi rule goes to both Western Allies and Soviet Union. Even though one could argue that Germany, with Hitler's insane policies, never had any real opportunity to win the war. However, we should also not forget that even though Soviet Union was attacked by the Nazis, she also went out as an aggressor. First splitting Eastern Europe with Germany and then invading the nations unwilling to fall to Stalin's dictatorship. In reading the comments posted here you get to see the very important role each party in the conflict. Without Britain remaining free there would have been no allied landing in France. Where would the staging area have been, Iceland? Without the United States the enormous amounts of equipment needed by all allied powers would not have been there. The Soviets benefited greatly from the West tying down about one million German troops in Italy. But once the Germans were stalled outside Moscow in 1941 they had arguably lost the war. I'm not the only one to see it that way either. I contend that if there had been an invasion of France a year earlier, it might have lost the war for the Allies rather than win it. This was a major undertaking, and had to be successful, otherwise the losses would have meant that no other such landings could have been attempted for a very long time. This would have given Hitler the time to relocate his resources towards the Russian Front and perhaps win that battle, and with that strengthened, he would have had an excellent bargaining position with the Allies. The raid on Dieppe showed that the Allies were not ready in 1943, and thank God they waited until they were ready. The biggest loser in the war was Britain, who lost her empire, foreign assets and was still paying for the cost of the war (mostly to the USA) decades later. The Soviets had the highest casualties, both civilian and military, but won a moral victory despite their leaders incompetence. The Americans were the real winners, they came out of the Great Depression with a stable/growing economy, made loads of money and still claim the moral high ground to this day. However, I believe that Britain should take the 'winners medal' as it took almost two years before the USA and the USSR declared war on Germany. Therefore without Britain's heroic lone stand we wouldn't even be having this discussion. It has been unacceptable, within the context of the North American and European propaganda models that determine our media content, for the significant Soviet contribution to the German defeat to be given due consideration. Personally I doubt if that will change any time soon, particularly since drawing attention to US and UK support for the genocidal dictatorship of Stalin during the war years is not something Western politicians are likely to want to do. The Allied bombing campaigns, or any other activity, could have occurred without the German army grinding itself out upon 20m Russians. If Germany had stuck to the terms of the treaty set out before the war, it could have brought everything to bear against the Western front, making it very difficult, if not impossible for Britain, the US, and the other Allied powers to break through successfully at any point. While the West did supply the USSR, it was Russian boys dying by the score. I would love to see a more diverse approach to such views. It seems that on topic of WWII there is an overwhelming support for the Western view but very little consideration/analysis of Russian (Soviet Union) point of view. The least we can do is to truly consider both sides. We are often guilty of looking at historic events from our own perspective, but in this case it was most definitely a joint effort. Imagine a "what if" scenario if Germany had never invaded the Soviet Union. With the supplies of raw materials from Russia and without the distraction of a second front, the Germans could have made Europe an impenetrable fortress and Allied hopes of liberating Europe would have floundered on the beaches of Normandy. Alternatively, if Britain had reached a peace with Germany and the West remained out of the war then the likelihood is Germany would have made it to Moscow and the Soviet Union would have fallen. Its clear that only together squeezing Germany from both sides could the allies achieve victory. It is high time the Western allies gave the Red Army its due. They did indeed do most of the on-ground fighting against Germany. With them holding down and wearing down in the east, Germany didn't have the resources to repel the sea-borne invasions in the West. This also permitted the other allies to allocate resources for a full-scale operation against Japan, which is also often mistakenly thought of as a side show. The Americans lost 300,000 in WWII. We British lost 600,000. The Russians lost 17-20 million. I don't have any doubt who made the greatest contribution to the defeat of Nazism. If we had lost the Battle of Britain at the beginning of the war there would have been no western front and no supply routes to Russia. Consequently, the above arguments would have been made irrelevant. Whilst we could not win the war, by not losing at this early stage this battle was the most important factor. Who cares who contributed the most? The point is that ordinary people worked together to overcome a tyrannical foe that brought death, fear and misery to countless millions of people. Let's just be thankful to everyone, dead or alive, who played their part. Why can't both sides just admit they couldn't have won without the other? Without the eastern front millions more German soldiers would have been waiting in France on D-Day. Without the essential supplies the Russians could have held their ground, but could not have pushed onwards into Germany. It was a joint effort... be proud of your co-operation! The critical point of the war was the Nazi failure to invade Russia early enough in 1941. If they had captured the main cities (Moscow, Leningrad) before winter set in, they could have held out forever. Once they became marooned in the Russian countryside and Russia was unbroken it only became a matter of when, not if, they would lose. The poor tactics, leadership and equipment of Britain, France and the USSR at the start had given an exaggerated view of Germany's power. By the start of 1942 everyone realised death was preferable to surrender to the Nazis, so Hitler was doomed. Had the USA not had two wars to fight (Japan and Germany) the Nazis would have been destroyed much earlier. Though hardly a paper tiger, Nazi power is greatly overestimated. It succeeded at the start because its enemies were caught on the hop, a lesson which fed the arms race of the Cold War. Russia's victory divides world opinion, writes the BBC's Jonathan Marcus. What does VJ/VE Day mean?